Aaron Judge (wrist) took eleven at-bats against A.J. Cole, Chance Adams, and minor league lefty Phil Diehl*. He came through fine. 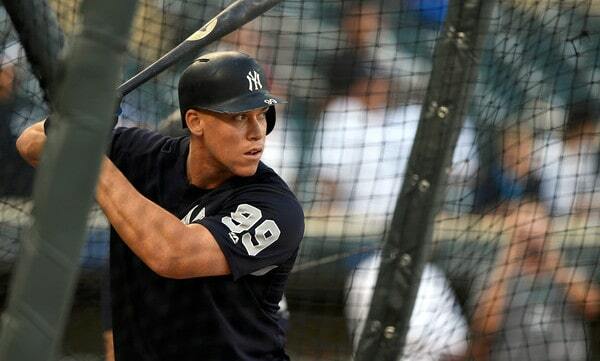 Judge has been taking batting practice for about a week now. This was the first time he faced live pitching since landing on the disabled list two months ago. Aroldis Chapman (knee) threw 22 pitches in a simulated game. He faced Kyle Higashioka and Tyler Wade. Chapman had no issues. He threw two bullpen sessions in recent days and this was the first time he faced hitters since going on the disabled list last month. Judge was activated off the disabled list over the weekend, but only to play defense and run he bases. The Yankees have indicated he could return as a hitter sometime this week. I suppose his return date depends how he felt today and how he feels tomorrow. Chapman is expected back sometime this week as well. * The Yankees must really like Diehl to bring him to New York for a dinky sim game. September call-up Stephen Tarpley could’ve thrown to Judge to have him face a lefty. Diehl, the team’s 27th round pick in 2016, had a 2.51 ERA (2.24 FIP) with 36.2% strikeouts and 7.7% walks in 75.1 innings at High-A and Double-A this year. He was on the Triple-A postseason roster as well.